Take your cocktails and smoothies to the next level with this Monin 1 liter raspberry fruit puree! Boasting a sweet taste and aroma, this rich, premium puree is textured with all-natural raspberry seeds and will have your guests envisioning warm, summer afternoons and light, refreshing breezes. It is easy to use and can simply be blended with juice and ice to create mouth-watering martinis, sangrias, iced teas, and lemonades. You can also use it to make sauces for your shrimp, wings, and kebabs or toppings for your cheesecakes, ice creams, and pies. 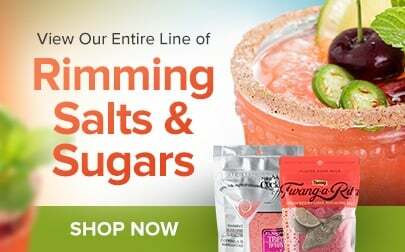 Plus, it's produced with pure cane sugar and no artificial flavors, making it an all-natural puree with a balanced blend of flavor and aroma that will instantly upgrade your signature drinks. 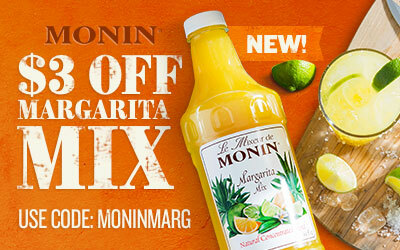 Since 1912, Monin has had a passion for delivering premium products that simplify the beverage-making process. Their sense of innovation and creativity has led to a wide variety of flavors and recipes to suit any menu. 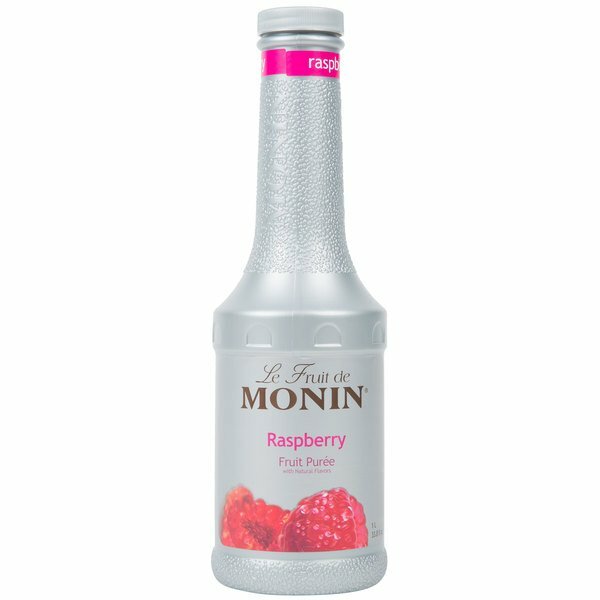 Use this Monin raspberry puree to craft superior beverages for your guests! I love the heavy duty bottles the puree are packaged in because it works so well with our pumps. The raspberry puree is great and the perfect balance of tart and sweet. Our customers absolutely love this product. The flavor is great - we use it to make flavored beverages for our customers. The customers come back repeatedly stating its the best flavored lemonade that they have had! Great flavor, we use these to make smoothies. The thing I love the most is the no mess cap, no dripping. Easy to use one handed when pouring. The raspberry syrup is very tang and delicious just like a fresh raspberry. It is perfect for making our raspberry buttercream frosting and pairs really nice with our lemonades. Mixed drinks or smoothies, this purée gives you the right amount of Fruit and sweetness. Wish the consistency was not so thick but it works. I used to be skeptical of raspberry puree because I always felt that it overpowered the beverage. However, after setting out to create the ultimate white chocolate raspberry mocha, my mind was forever changed when I came across this puree. The puree is sweet, tangy just like a fresh picked raspberry. The flavor is subtle enough to compliment the espresso, milk, and white chocolate sauce, but prominent enough to tell your taste buds that it is present. A great puree that will forever be on our coffee line. 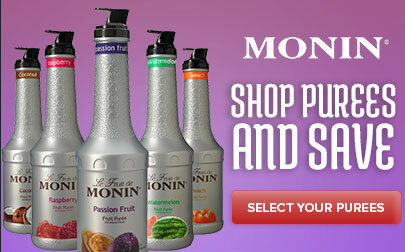 All of Monin's fruit purees are fantastic! We use quite a few at our coffee shop and raspberry is definitely top 3. Great flavor, great consistency. Goes great with yogurt in a smoothie, add it to iced tea for something different, or we even use it in coffee drinks, like a Raspberry White Mocha. Awesome product without a bunch of fillers!